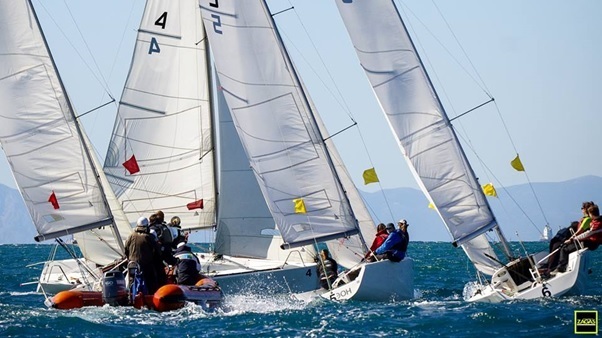 The Royal Cork Yacht Club was represented this weekend at a 2K Team Racing Regatta hosted by the Yacht Club of Greece. The two boat team, skippered by Fred Cudmore and George Kingston finished second, to a very strong Spinnaker Auspicious team, representing Spinnaker Sailing Club, UK. 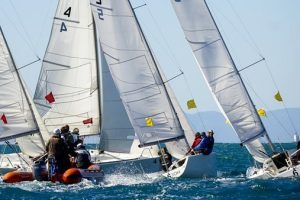 The racing took place on the Saronic Gulf, in Plateau 25s, over 3 days. 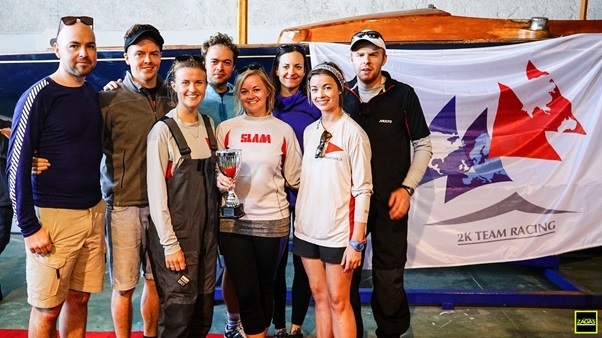 The Royal Cork were joined by 7 other teams, representing 5 different countries. ‘2K’ (2 keelboats) racing is a form of team racing where two boats sail against an opposing set, around a short and exciting course. The RCYC team consisted of Fred Cudmore, Lisa Tait, Philip, Sarah and Eimear O’Leary, George Kinston, Emma Geary and Philip McGlade. Day one of the regatta was unfortunately blown out due to high winds. Day 2 saw a long day on the water for all 7 teams, with a variety of wind conditions ranging from about 8-15 knots. The Royal Cork got off to a slow start, falling victim to the local knowledge of the Greek team off the startline, in what shaped up to be tense race with a flurry of protesting. The team regrouped and won all but one race that day, narrowly losing out to the Brits. RCYC finished the day lying in second, while Spinnaker Auspicious set the pace from the outset, with no losses at all that day. After a long wait onshore on the Sunday morning of day 3, the teams went afloat, to contest part of a second round robin. The Irish won all of their races, allowing them a place in the final, to come head to head with Spinnaker once again. The breeze was up, and there were champagne sailing conditions for the best of 3 final, with the stunning backdrop of Athens behind. The first race got off to a disappointing start, with the Brits enjoying a significant weight advantage and took off from the start line in what became a drag race around the course. The second race was much more hotly contested, with all RCYC team members hailing loads from the pre-start. Cudmore perfectly executed a duel with Brittish skipper Tom Hebbert, holding him off at the start, and Kingston started favourably against his counterpart, Sam Littlejohn on the left hand side of the course. The RCYC defended brilliantly throughout the first half of the race, but the Brits with the speed advantage fought back in an extremely intense final downwind and pulled off a well timed sweep at the very end, securing their 2-0 victory. The event was a fantastic success both on and off the water. The Yacht Club of Greece provided wonderful hospitality, while the 2K committee led by Bruce Hebbert ran a great show as always. Next stop on the 2K circuit for the RCYC team is likely to be Gaeta, Italy in July, where the team will be gunning for their first victory.